Happy September! I hope you enjoyed this hot summer and soaked as much as you can from the heat of the sun.The best thing for me this summer was spending time swimming, reading books and visiting family and of course travelling and eating lovely Jordanian food. But if I had to pick one it will be swimming in the sea in Tunisia and sitting on the beach. Although I have to say it was a nasty thing getting stung by a Jellyfish..Ouch! But that didn’t deter me from swimming again. Now I'm back in the studio, ready and excited to start my new paintings. So, every month I will be posting a painting where I will highlight an original painting from my studio, the story and the inspiration behind it. And you will get an opportunity to purchase it with a special offer. So for this month it's Genesis 5 from Genesis Series. I chose Genesis 5 as the image of this months. I guess it’s the time I spent swimming in the sea and enjoying the sun. As I’m getting ready for the cloudy British weather I wanted a memory of the sea and my time in Tunisia. I love the sun and the water and I’m blessed to be living on the south coast of the UK. Genesis 5 reminds me of the waters upon the earth that covers more than 70% of our earth's surface giving us life and also the water that fills our bodies. 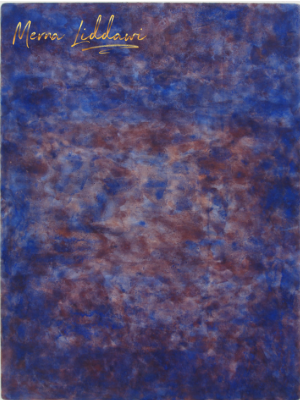 It has a sense of light coming through the dark blue azurite layers as if ripples of water reflect the light of the sun. It’s a painting to look out and remember the sea, and the life on our planet. The painting is part of a series of 10 paintings. It reflects the act of creation: from the vastness of the universe to the tiny cell in everything living. It reveals harmony in nature, in us and Divine beauty around us. The thin glazes of egg tempera give the painting a fresh look and a sense of light. Because of the thin glazes the light travels through the layers of paint and is reflected back into the eye. Genesis 5 has a lovely azurite blue pigment to give it a shimmering intense colour that reflects light. Azurite is a rare variety of gemstone-quality copper ore found in Persia, Sinai, and Morocco. The name comes from the Arabic /Persian word for blue 'azuraq' which means sky blue for its intense, jeweled like colour. 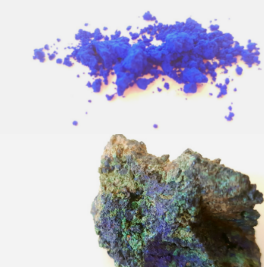 Azurite is one of two basic copper carbonate minerals (malachite is the other). Azurite is rarer than malachite and is considered more valuable. What was the best thing about this summer for you? Leave your comment below. Sign to my list and become ML Art-Insider to get special offers that are only exclusive to my list.